There are a handful of photos of me on the beach as a kid – my hair is white blonde, my skin brown, I only ever wore bather bottoms and my ‘sun protection’ was a smear of zinc cream across my nose. It was the seventies and no one knew better. Today we know that more than 1850 people die of skin cancer every year, that it takes only eleven minutes for skin to burn under the Australian sun and that sun protection is critical. The Australian Cancer Council have launched a new iPhone app in time for summer. 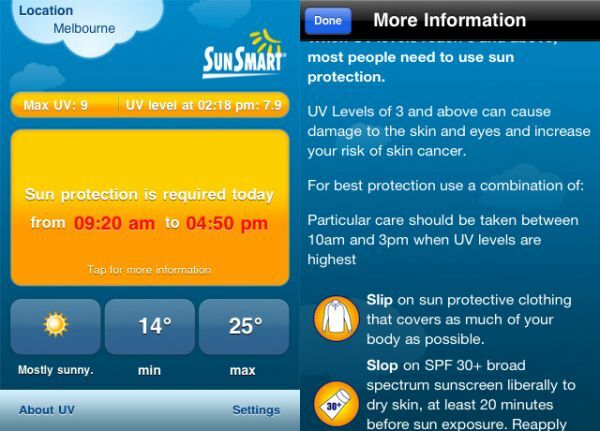 The SunSmart app uses GPS to provide UV levels, sun protection times and daily weather forecasts for your local area. The app also offers a reminder function that alerts users of their daily sun protection needs and when it’s safe to get some sun for vitamin D. All the UV alerts and weather forecast information used for the app are provided daily by the Bureau of Meteorology. The app is free and is available from iTunes.